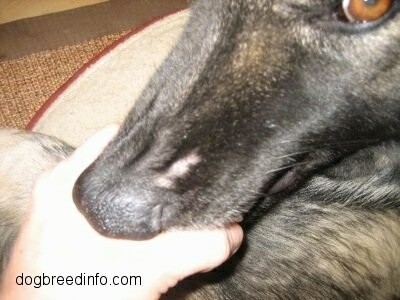 About six months ago my dog started to lose hair around her muzzle. There were roughly five bald spots varying in size from that of a peanut to an almond. Where the skin showed, it was bright pink and/or red. I took my dog to the vet to see what this was. He took one look at her and said, "I hope it isn't what I think it is." He proceeded to take scrapings of her skin right from the infected area and looked at it under a slide. Sure enough, he was right. She had what is called red mange a.k.a. puppy mange. 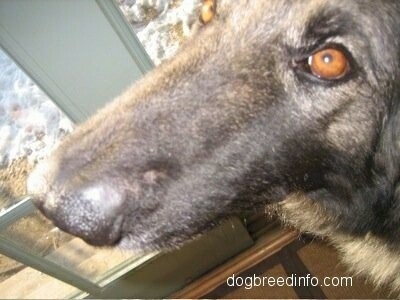 He told me that all dogs have this microorganism on their bodies and that in small normal amounts it causes no harm. 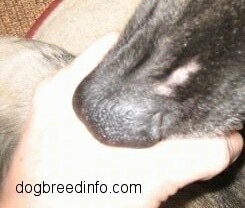 But for some unknown reason, those mange bugs can multiply and that's when they cause this red rash and hair loss. It is believed that "stress" can be a factor in the outbreak, but again, why is still unknown. My vet told me that there is nothing we can really do. He said that some patients thought they saw a change when applying Frontline directly to the infected area, but actually there is really no cure. So I was basically told there was nothing I could do. The mange was getting worse, and it hurt extra for me because to me, my breed of dog, the Shiloh Shepherd, is the most beautiful creature on God's earth. I wanted my girl to have her perfect face back, and I'm sure the redness must have been uncomfortable although I saw no signs of distress from her. I later read on the Internet that there are treatments using dip solution containing amitraz (Tactik or Mitoban) which is toxic and is usually done at an animal hospital, racking up a large bill. Milbemycin oxime has also been used, but is also expensive. Another is the use of oral Ivomec, which is an injectable cattle wormer. Since these methods sounded toxic and pricey and my vet wasn't familiar with them, I knew I probably should investigate other options. That's when I thought of my sister who has been using a homeopathic method for several years to manage her chronic Lyme disease. See, typical antibiotics don't work after having the disease for such a long time as my sister Chris did. She went undiagnosed for nearly a decade. She was so sick she couldn't even get out of bed. That's when she heard about an alternative method for curing, or at least managing, Lyme disease. It is called colloidal silver. She bought the colloidal silver-making mechanism, or generator, online from a company called SilverGen. At home she mixes up batches of colloidal silver from steam-distilled water which she buys at her grocery store. It takes roughly two hours to mix up a 32 oz. 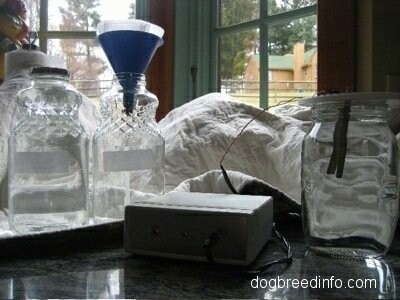 batch of colloidal silver. Colloidal is a term that means the silver is suspended in the water, not sunk to the bottom doing no good. 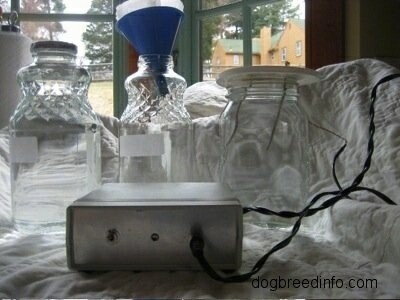 This is the apparatus, a silver generator with two silver strips hanging in the distilled water. The water is clear and hard to see, but it's there and filled to the top of the jar. The generator shown is about ten years old. The new ones look a little different. I remember thinking Lyme is a bacteria in the form of a microorganism called a spirochete. Red mange is a microorganism shaped like little hotdogs with legs all around it. If the silver solution is working great for my sister's Lyme, would it not also do some good for my dog's mange? I phoned her that day after the vet appointment and she mailed me four batches of colloidal silver. I put some of the solution in a spray bottle and sprayed my dog's infected area, her muzzle, twice a day, morning and evening. I also poured about one cup of the colloidal silver in her drinking water. Since she is a large dog, 105 lbs., she has a big bowl, so a full cup was necessary. 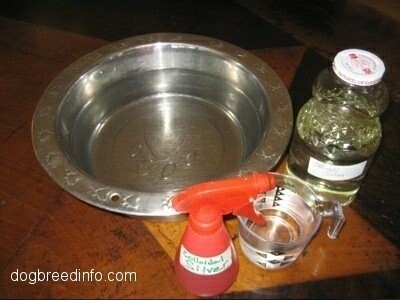 Smaller bowls would take smaller amounts of the silver solution. Within a few days, I thought I could see change. By the end of the week, the hair was growing back for sure and the redness had disappeared. Within two weeks it was time to take her back to the vet. The mange was completely gone and her hair had grown back almost completely. A week after that, she looked like she never had the mange at all. MY vet was VERY impressed and thought it was interesting that I tried the colloidal silver. He was only a little skeptical that it could have disappeared on its own regardless of the treatment, because sometimes that actually does happen. But he was still very intrigued. That was nearly one year ago. Unfortunately I did not document the entire process. Eventually I ran out of the silver and thought I should probably buy one of the generators in case it should ever come back. Well, nearly one year later, it's back. It's nothing as bad as it was the last time, but this is how it started a year ago. There is only one spot (so far) this time but last time it started this way and then proceeded to get progressively worse. My sister just so happened to be visiting me this week so she bought her apparatus along with her. This time I'm documenting the recovery. Hopefully it wasn't just a fluke, and I, in fact, have discovered a cure for red mange. This started out as just a small dot. It's gotten bigger over the last four weeks, not better. The other side now is starting to show signs of slight balding, but too little to show on the camera. But I decided to treat her NOW, and not wait for it to get even worse or as bad as the last time. I'm quite aware of how bad it can get. Last time there were about five spots similar to this one, only some were bigger and most were red. Day 4—you can already see an improvement.